What is a hyperextend elbow? A hyperextended elbow occurs when your elbow is forced to bend the opposite way of what it normally should. Depending on the extent of hyperextension, this can cause issues like stiffness and a temporary lack of mobility. And, it can often cause damage to ligaments, muscles, and even the structure of the elbow. 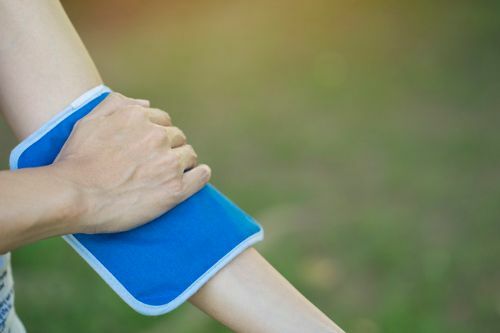 In this article, we will explain the causes and symptoms of hyperextending elbows, as well as possible avenues of treatment like exercises and stretches, as well as elements of the recovery process. What Causes a Hyperextended Elbow? As mentioned, elbow hyperextension is when your elbow has bent backward in a way that it wasn’t meant to. Your elbow is made up of three main joints: the humeroulnar joint, the humeroradial joint, and the superior radioulnar joint. Hyperextension occurs when the humeroulnar joint bends backward past the point it would normally be able to go. It usually occurs during a physical activity that engages your elbow, like playing a sport, especially where contact can occur. An overextended elbow can also occur when trying to catch yourself from a fall. What are hyperextended elbow symptoms? A hyperextended elbow has one main symptom, and that is pain. It may manifest in different ways while dealing with a hyperextended elbow, but at the end of the day, your elbow will hurt. Hyperextended elbow treatment will depend on the severity of the injury. Your elbow will need rest. In less severe cases of elbow hyperextension, this may be all you need. Rest can allow your body time to heal and naturally put back into place some of the parts that may have been dislocated when the hyperextension occurred. Elevating your elbow can help the healing process, especially during the first few days of the injury. Use a couple of pillows to elevate while you are sitting or lying down. Doing this will help reduce swelling in the area. An ice pack can also be used to help reduce swelling and numb the pain. Do not allow the ice pack to make direct contact with your skin as it may cause frostbite. Place the ice pack on the elbow for 10 to 20 minutes. An elastic or compression bandage can help the treatment process by limiting elbow movement, thus decreasing the chances of re-injury. The compression this type of bandage provides can also help support the veins in the affected area. This allows for better circulation in the injured area, which in turn, promotes healing. Wearing an elbow brace is more effective in restricting elbow movement than a compression bandage. This lack of movement allows the body to time to heal without the risk of re-injury, as well as giving added support to the injured elbow. There are several exercises that you can perform for a hyperextended elbow to help rebuild strength and flexibility (this will be discussed in greater detail in the next section of this article). More serious cases of a hyperextended elbow may require surgery. When you hyperextend your elbow, it is not unusual to have damage to the connective tissue and ligaments that help your arm and elbow function properly. Sometimes this damage is severe enough that a doctor may have to open your elbow to try and repair it. There are many exercises that you can do to help treat and repair the damage that comes with a hyperextended elbow. These exercises are designed to help relieve hyperextended elbow symptoms and repair the damage. Take your injured arm and stretch it in front of your body parallel to the ground. Rotate the arm until your palm is facing towards the ceiling. Take your other hand, grasp the hand of the injured extended arm, and bend the elbow backward. It’s important to relax the injured arm as much as possible as it will allow for a better stretch. Hold the stretch for a few moments and then relax the stretch. Repeat this for a few repetitions. Sit or stand with the injured arm by your side. Then place your feet about shoulder-width apart. Extend the injured arm until it’s parallel to the ground in front of your body with the palm facing down. Using your other hand, press down on your wrist until you feel the stretch in your forearm and elbow. Hold this stretch for a few moments. Then relax the stretch and repeat for a few repetitions. Take your injured elbow and bend it at a 90-degree angle with your palm facing your body. Keep the elbow tucked close to your body and flex the fingers of your injured arm into a fist. Place the palm of your other hand under your clenched hand. Press down as if you were trying to straighten your arm while resisting any elbow movement with your other hand. Hold this stretch for about five seconds. Then relax and repeat 10 times. Bend the injured arm at the elbow with your forearm parallel to the ground and your palm facing up. Be sure that your elbow remains by your side throughout this exercise. Take your other hand and place it on top of the hand of your injured arm and press down. Use the muscles of your injured arm to resist any movement in your injured elbow. Hold this contraction for about five seconds. Then relax and repeat 10 times. Perform this three times a day. Another way you can help support and treat your elbow is by taping it up. You may be wondering how to tape an elbow, so we have provided brief instructions below. 1.5-inch non-stretch zinc oxide tape. Also, make sure that the area you are going to be taping has hair removed via your method of choice. This will allow the tape to stick better. Position your elbow at a slight bend, making sure there is no pain in the bend. Apply two anchors around the middle of the forearm followed by two around the middle of the bicep using the 2-inch elastic adhesive tape. Make a fist and tense the bicep muscles when applying the tape. This will allow the muscles to expand and increase blood flow. Form a checkrein or crossed fan with between four and six pieces of 1.5-inch non-stretch zinc oxide tape. Measure the length of each piece so it will connect the upper and lower anchors with the arm in a slightly bent position. Secure the checkrein between the two anchors and “close.” Or, you can cover the ends with another strip of elastic adhesive bandage. How long does a hyperextended elbow take to heal? It really depends on how severe the injury is. Mild hyperextension of the elbow may disappear after a few days of treatment and rest. But in more severe cases, it may take a few weeks to a month before the injury is healed. In the case of a hyperextended elbow that requires surgery, more healing time may be required. A hyperextended elbow is painful and restricts movement. But, if treated properly, it may not be an issue for a long period of time. The key is to make sure you recognize the hyperextended elbow for what it is and look after it with proper rest and treatment. If it doesn’t seem to be getting better, see a doctor immediately. “Elbow Hyperextension,” Sports Injury Clinic, http://www.sportsinjuryclinic.net/sport-injuries/elbow-pain/acute-elbow-injuries/elbow-hyperextension, last accessed September 26, 2017. “Hyperextension Injury of the Elbow,” The Hand and Wrist Institute, http://www.handandwristinstitute.com/hyperextension-injury-elbow-specialist/, last accessed September 26, 2017. Wagers, K., “Elbow Hyperextended Treatment,” eHow, http://www.ehow.com/about_5201107_elbow-hyperextended-treatment.html, last accessed September 26, 2017.